A fire at a commercial building in Hawthorne Wednesday night has been knocked down. The blaze started about 8:45 p.m. in a one-story commercial building at a strip mall in the 12700 block of Hawthorne Boulevard, according to the Los Angeles County Fire Department. Crews declared the blaze a three-alarm fire an hour about 9:42 p.m. and deployed an additional 40 firefighters to help. Some 150 to 200 firefighters got the fire under control within a couple of hours. Aerial video showed the flames atop a building next to a Chase Bank. Flames could be seen pouring from the roof of what appeared to be a Super Discount store and Little Asia Chinese Restaurant. 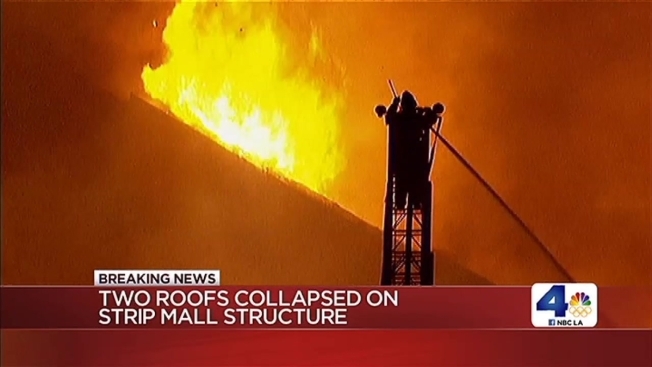 READ: Target Shoppers' Credit Card Info Stolen Across U.S.
Fire officials said the blaze may have started in the Super Discount store, then spread to the ceilings and attic space shared with the Little Asia Chinese restaurant. Some restaurant employees were inside when the fire started, but they made it outside before it erupted into sky-high flames. No injuries were reported in the blaze, but the owner of the Super Discount store was seen in an ambulance at the scene. Officials did not say whether he was hurt.